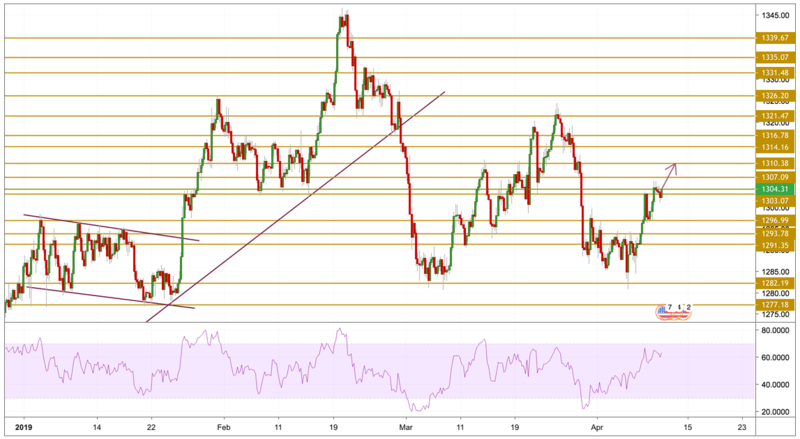 The yellow metal witnessed a pullback from its upward trajectory since the day-start as investors remain cautious ahead of key events while positive news reports also favored profit taking. Not only absence of new developments concerning the US-China trade deal but geopolitical plays surrounding Libya, Saudi Arabia, the US and the EU were also supporting the yellow metal buyers off-late. Risk aversion could also be witnessed through 10-year treasury yield from the US which is one basis point weaker than yesterday’s 2.5%. In addition to the results from the trade talk between the world’s two largest economies, the US inflation and minutes of the latest Fed meeting will also be closely observed during the day with also a fully packed economic calendar in the EU. Gold built on its goodish intraday positive move and climbed further beyond the key $1300 psychological mark, to near two-week tops during yesterday's session to reach a high of $1306.09 per ounce. The price is currently hovering around the $1304.18 support level with a relatively bullish momentum. The upward move seems more likely to continue and that is why we will be focusing on the $1310.38 resistance level.